I’ve seen a lot of other readers do publish weekly readings and people seem to like them. I find a couple of things odd about it, which is one reason I haven’t started doing it. Most of these readings are 3-card readings but they are also temporal readings, meaning the three cards are supposed to represent 7 days as the beginning, middle and end of the week. Of course, 7 days don’t really break up evenly like that. Some say Card 1 is for Mon/Tues, Card 2 is for Wed/Thurs and Card 3 is for “the weekend.” I suppose that makes a kind of sense, but sometimes I find more Real Life happens on the weekend, while the week is concentrated on Work Life. So, having only 1 card represent the weekend seems a little light. However 3-card readings can also lend themselves to other breakdowns, like Body/Mind/Spirit or Health/Work/Relationships (or Family) or other break downs. I’m probably going to do one of those most weeks. The other thing I find weird is that to me, readings are intensely personal, so saying that a reading is for everyone. . . strikes me as odd. I know that it’s general energy trends, not specifics, but I still find it weird. I don’t know if I can do that. So, for now, I’m going to do the reading as if it were for me, and if I can see how it can relate to everyone, I’ll put that in. I’m also going to ask for feedback. 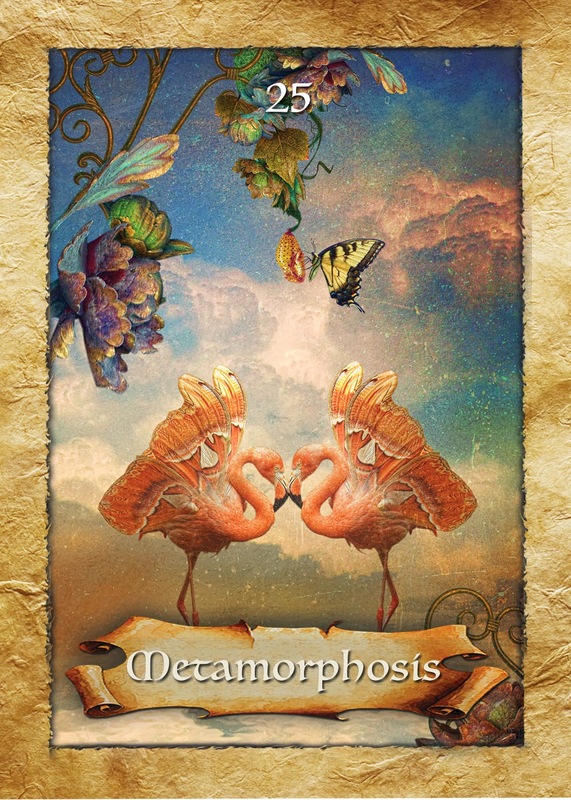 . . if you can see how a card or interpretation can relate to you, let me know! Now, onto the reading. . . .
I’m using Colette Baron-Reid’s Enchanted Map deck this week. That makes total sense. Upright the card would indicate that I am in balance, reversed, I am not. And it’s true. My own physical health has taken a backseat to many other things. I’m not active and I have not been eating well. I’m also having trouble sleeping. It looks as though this may continue. 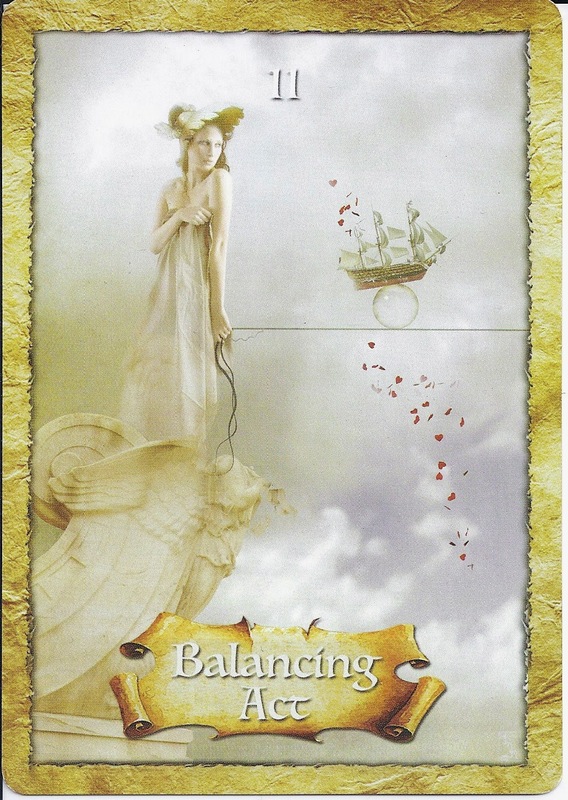 But I think I’ve drawn the card to get me to focus on this issue, so I can use it to focus on my health. Interestingly, my eyes are drawn most to the heart-shaped flower petals, which are supposed to represent love and devotion. That being out of whack is something that has been on my mind lately, as well. This image of the Elephant is enchanting. 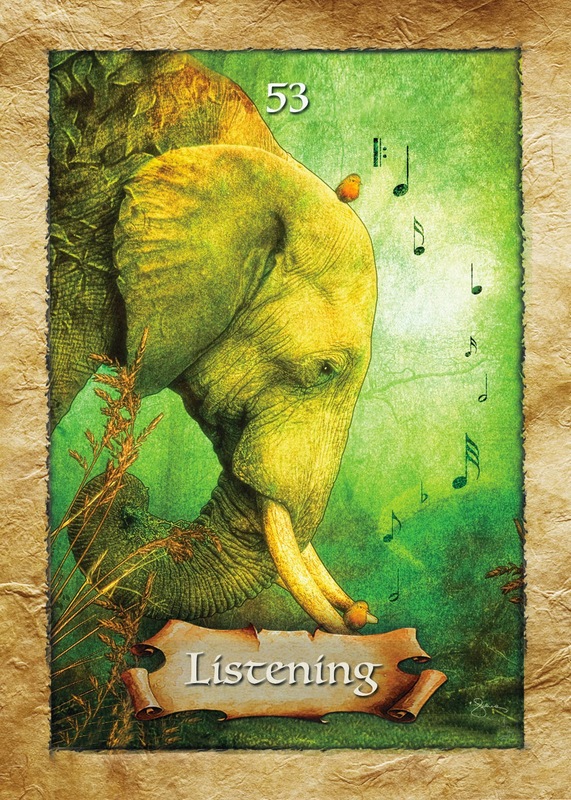 The elephant has large ears to hear, and there seems to be music playing, or is that the birds singing? The green is a calming and healing color. My eyes are drawn to the elephant’s wise and knowing face. He cannot see the birds where they are perched (well, maybe the one on his tusk) but he doesn’t question where the music is coming from, he just knows. Elephants are symbols of memory, wisdom and good fortune. They always remind me of my great-grandmother. Edith always had elephant statues and on jewelry as symbols of good luck. It’s funny because after months of being silent on the blog, I’m just starting to write again, finding my voice, and now the guidance is to Listen. And just the last few days, I’ve been realizing that I’ve turned back to using entertainment as distraction. I’ve been watching all these British shows on Hulu, pretty much non-stop (as I discovered a few I had never seen). I enjoy the shows, but I’m using it as a way to avoid going within, to avoid Listening to my higher self or to Spirit. I suspect it’s because I think I’m not going to like what I hear, so I want to avoid hearing it. But it’s time. It’s time to hear what’s been trying to come through. The butterfly on the chrysalis is an obvious symbol here. Going through great changes. But aren’t we always going through changes? If you aren’t changing inside, are you even alive? Reversed, this is supposed to be a reminder that change can be painful, but worth it. Funny, I’ve been thinking the worst is behind me. Perhaps not. Perhaps there is more spiritually difficult times on the horizon, and this is a reminder to keep the end-game in mind? My eyes are drawn this time to the flamingos, with their necks curving into a heart shape. Maybe that does make sense, with some things in my personal life that have been coming to light recently, and ties back into the first card. Yes, change can be uncomfortable. And it can hurt to give up on long-held dreams. But, sometimes that change really is necessary. So, do any of these cards speak to you? Do you see symbolism different than I’ve mentioned? Not to get too awful salesy, but if you’d like to book a reading with this deck, you can do so here. Ishtar, this is such a lovely format, and they are such beautiful cards! I, too, am feeling the need (and the resistance) to listen, and readying myself for uncomfortable change. Knowing that makes me wonder if I really have found that balance for my body, just yet. Just when I think it's there, I start to see how I'm still just moving towards it. So, yes, I can see how these cards fit my week. I'm looking forward to the next one!